Spacious canal front home in City by the Sea with easy access to Redfish Bay and Estes Flats! The Best Catch is truly one of the best! 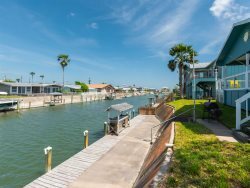 Enjoy the coastal flair of this awesome home located in City by the Sea perfectly situated between Rockport, Port Aransas and Aransas Pass. 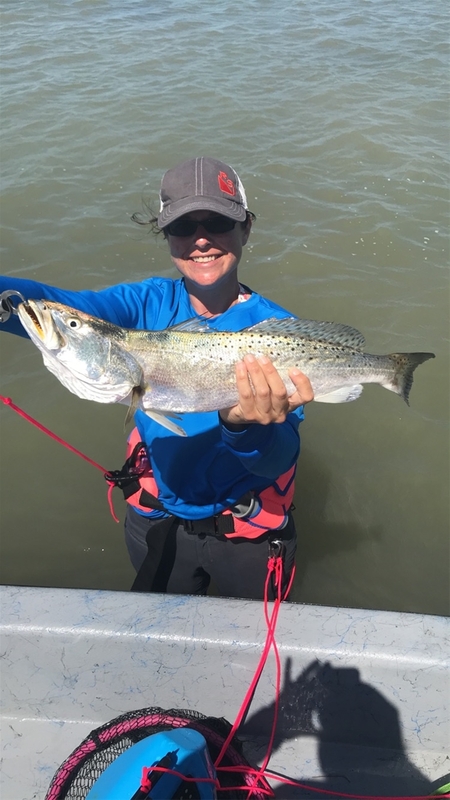 The Best Catch is located on a deep channel just minutes from some of best fishing that Rockport and the coastal bend has to offer. This home sits right off the Intracoastal Waterway, Redfish Bay, and Estes Flats for easy access by boat or kayak. The Cove Harbor Marina is only a few miles away and has a great boat launch, bait stand and restaurant. Launch your boat and tie up at the private boat/fishing dock right behind the house. The Best Catch is a 2 story home with the main living area and kitchen upstairs. An open floor plan includes large, comfy couches for relaxing, 2 dining tables, and a galley style kitchen. Large windows overlook the canal or step outside to the shaded deck to enjoy the views. There are 2 bedrooms upstairs, one with a queen size bed and the other with 2 queen size beds. Each upstairs bedroom has its own bathroom. Downstairs you will find 2 more bedrooms - one with a queen size bed and the other with 2 twins - and a sitting area with a futon and a kitchenette. The Best Catch now has a high definition TV as well as 3 additional TVs. A pool table has been added for indoor entertainment. Walk out the back of the house to the canal where you can tie up a boat, clean your fish, or just sit by the water and enjoy the view and the breeze. A variety of birds and ducks can be seen in the canals. This house is only minutes away from downtown Rockport, Port Aransas and Aransas Pass where there tons of things to do. Spend a night out on Market Street going to the many cute shops and eating fresh seafood on the water. This house is also only a short drive away from the Rockport Beach where you can find more fishing, birding, and swimming. Also don’t forget to check out some of our historical sites and parks including The Fulton Mansion, Memorial Park, The Texas Maritime Museum, and Goose Island National Park. You cannot go wrong with this house and this town. Whether you choose to spend your vacation relaxing, fishing, boating or shopping, Rockport is the vacation spot for you! The people we talked with were very nice and helpful. Lovely home with nice decks and chairs and beautiful views. We have always rented from Miss kitty's they have always met our expectations !